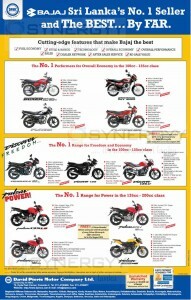 Man was made for motorcycles. 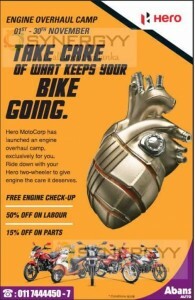 That’s where the magic begins, No other machine on earth captures the absolute surge of freedom, power, speed and exhilaration with the economy that motorcycles alone can bring. 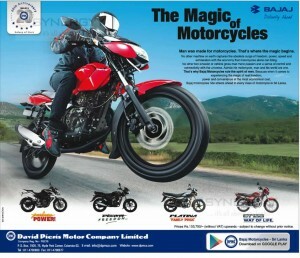 No other two wheeler or vehicle gives man more passion and a sense of control and connectivity with the universe. 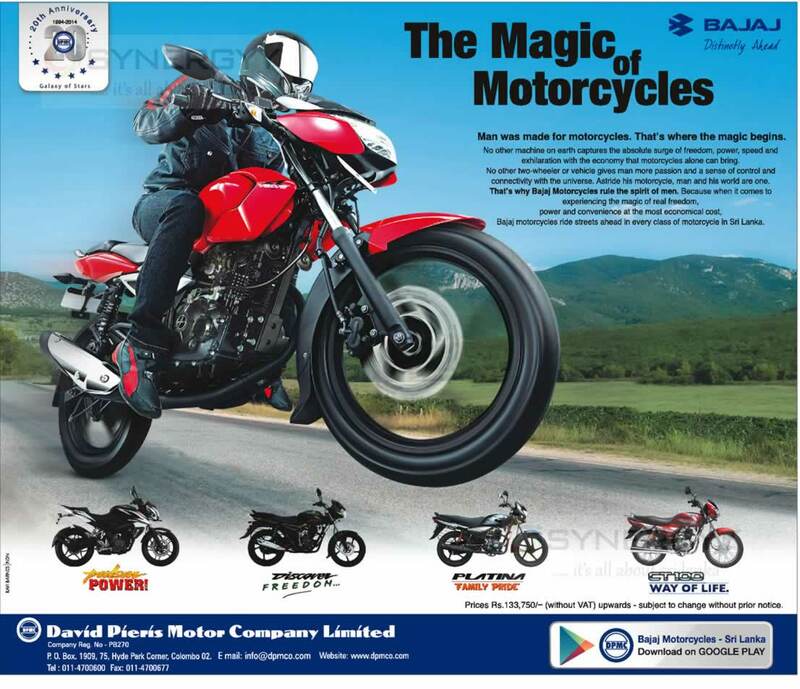 Astride his motorcycle, man and his world are one. 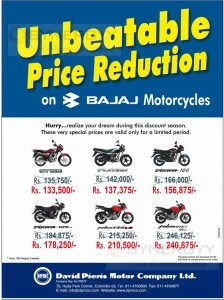 That’s why Bajaj Motorcycles rule the spirit of men. Because when it comes to experiencing the magic of real freedom, power and convenience at the most economical cost, Bajaj motorcycles ride streets ahead in every class of motorcycle In Sri Lanka. 0 to 60 kmph in just 3.6 sec. 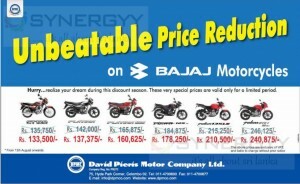 Easy payment schemes available for American express, Commercial bank and Sampath Bank Credit card holders. 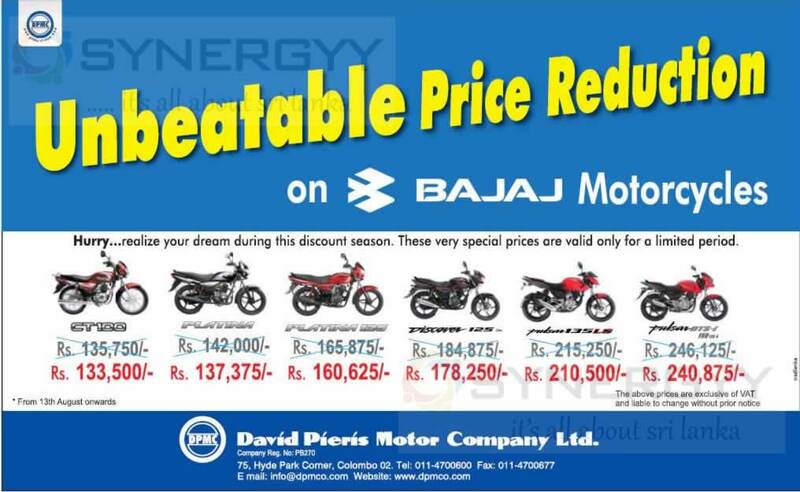 Are you looking forward to buy a Brand New Motor cycles, here DPMC announces its New Prices for Bajaj Motor Cycle Prices in Sri Lanka. 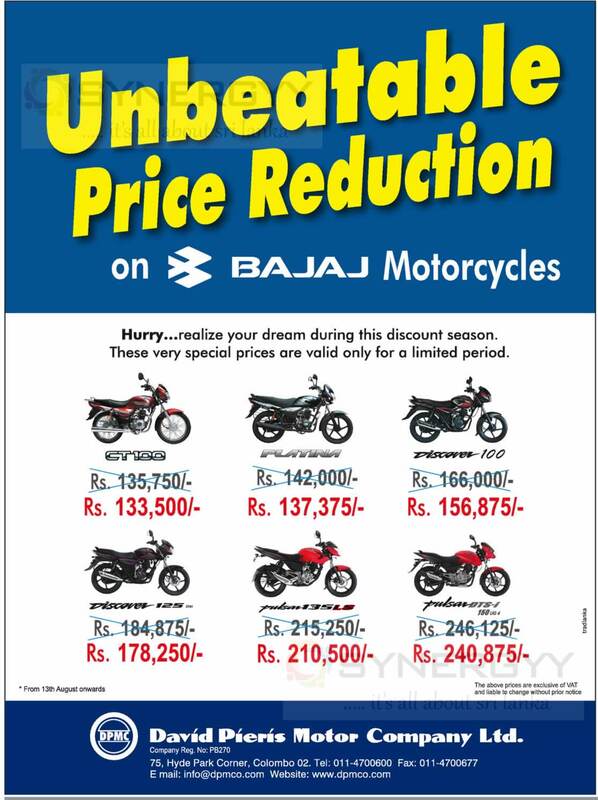 These very special prices are valid only for a limited period, therefore hurry up today and book your Bajaj Motor Cycles. 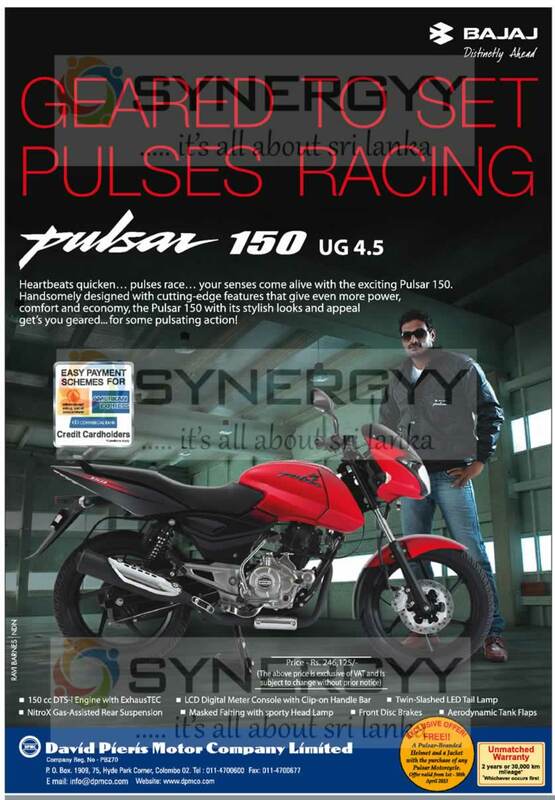 Heartbeats quicken, Pulses race, your senses come alive with the exciting Pulsar 150 UG 4.5. 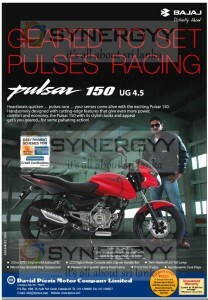 Handsomely designed with cutting edge features that give even more power, comfort and economy, the Pulsar 150 with its stylish looks and appeal gets you geared for some pulsating actions at Rs. 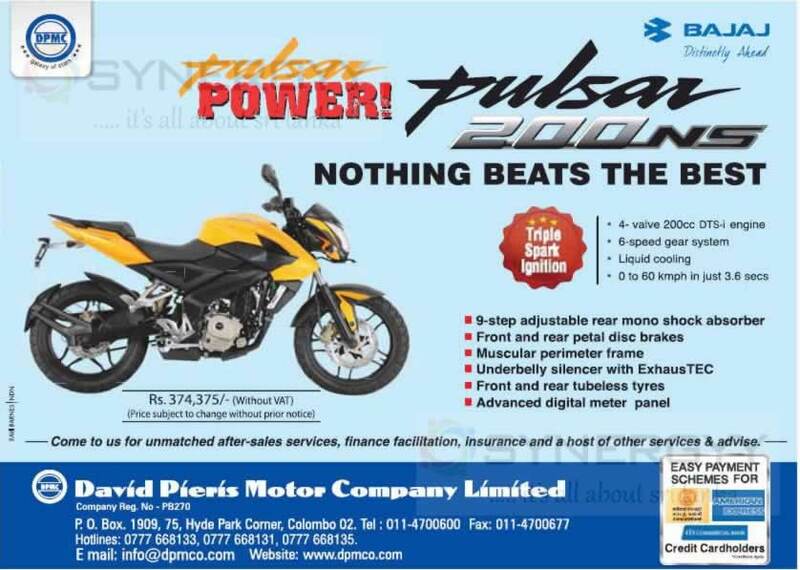 275,660.00 (All Inclusive) and easy payment scheme available for American Express, Commercial and Sampath Bank Credit card holders.